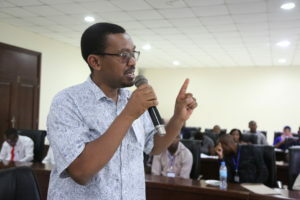 (Bagamoyo, Aprili 5 2019) Health professionals from Zoonotic disease risk areas of Tanzania have undergone training on using “One Health” approach to prevent pandemics. The special training program was officially launched on April 5 2019 in Bagamoyo. The approach, being implemented through USAID PREDICT project, among others, seeks to strengthen national health security through workforce development in Tanzania’s most vulnerable areas for viral spillover and spread. The PREDICT project is aimed at strengthening Tanzania’s One Health workforce through trainings and workshops that build technical and communication skills required by health workers on the frontlines of disease spillover and spread. Since 2009, PREDICT has trained more than 200 individuals in Tanzania, many in vulnerable and remote hotspots where zoonotic and transboundary diseases pose the greatest threat to animal and human health. PREDICT/Tanzania’s team, based at the Sokoine University of Agriculture and Ifakara Health Institute, have worked with Government of Tanzania and community partners to collect and test samples from over 1,700 animals and 900 people for zoonotic viruses, understand behavioral risks associated with disease transmission and spread, and identify strategies for disease prevention and control. The training targets health professionals and uses PREDICT as a model to share knowledge, strengthen technical skills for zoonotic disease surveillance and detection, and catalyze multi-sectoral collaboration to strengthen Tanzania’s health security in areas most at-risk from viral spillover and spread. Going forward, PREDICT commits to continue working with the Government of Tanzania partners from national to subnational levels to develop targeted surveillance and risk communication strategies grounded in the One Health approach.